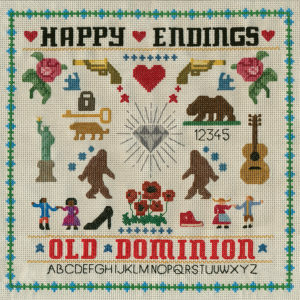 Old Dominion – Happy Endings: The five piece return with another stellar set of catchy pop-country tunes. Old Dominion are band whose members have been growing a reputation for a long time after penned hits for stars such as Sam Hunt, The Band Perry and Kerry Chesney all before launching onto the scene a couple of years a go with their Back to the Future themed video for single ‘Break Up With Him’. Since the release of their breakout 2015 album ‘Meat and Candy’ Old Dominion have been growing a large and seriously devoted fan base thanks to the way that they interact with the fans, their fun live shows and penchant for a catchy song or two. 2017 sees the band return with their highly anticipated sophomore album entitled ‘Happy Endings’. The album kicks of with the lead single ‘No Such Thing as a Broken Heart’. This song is Old Dominion all over and really carries on where ‘Meat and Candy’ left off. The verses are full of the familiar Matt Ramsey ‘smoothness’ with hand clapped percussion before a big catchy chorus. It’s a song which is life affirming and talks about being defiant and living every minute to it’s maximum after all ‘you can’t keep the ground from shaking no matter how hard you try, you can’t keep the sunset from fading’ and ‘you’ve got to love like there’s no such thing as a broken heart’. For fans of Old Dominion this is a huge welcome back! ‘Shoe Shopping’ comes next and is one of five songs that were released in the run up to the full album coming out. It kicks off with a piano and Matt singing before the chorus oozes all of that laid back feel that Old Dominion specialise in. Lyrically it’s all about the metaphor of finding a partner being like shopping for shoes – ‘if you’re shoe shopping try me on for size’. This is a step into a more R&B flavoured direction for the band. Next up is a song that has become a favourite for fans at live shows lately in ‘Not Everything’s About You Anymore’. It kicks off with a brilliant acappella vocal from the band, who are all great vocalists I must add (well, drummer Whit is an unknown quantity! ), before it moves into a big build up and chorus. It has all of those poetic lyrics that we’d expect from the band with lines like ‘drink to this, drink to that, throw that eight ball in the rack’. It’s a great song to listen to when you’ve gone through a break up and got to that stage where you just don’t care any more. In typical Old Dominion fashion they really hit the mark in singing songs that people can relate to. Track four, ‘Hotel Key’, kicks off with a great funky guitar from Brad Tursi. It’s another of those fun ‘candy’ songs from the band. You simply can’t stand still or feel unhappy listening to this one. Matt sings about a stolen night with a woman in a hotel room where she kept the key just to remind her of him. This one has got to be a live classic in the making – I can’t see any crowd managing to stand still with this one grooving! The chorus has such catchy, sing-a-long lyrics that it’ll be stuck in your head all day. Once again we have Old Dominion doing what they do best and making feel-good and catchy country! ‘Be With Me’ is up next and is definitely an early favourite for me – even if just for the line ‘you could be the captain of whatever floats your boat’. It’s a really great song to hear in the current country music scene where women are seen as objects who wear bikini’s and rock up to guys pickups for fun as Old Dominion sing about strong women who can achieve anything that they want to be. Matt sings ‘like your daddy told you when you were a little girl, you could be anything, why don’t you be with me, your mamma brought you up in a woman’s world, you could be anything’. It’s awesome to see a band like Old Dominion jumping on that equality bandwagon – it’s well overdue for a male country band! Also, it’s just a rocking tune! We take a little slow down for a moment with ‘Written in the Sand’. This song just sways along which fits perfect with Matt’s vocal. The thumping beat with acoustic guitar takes you away to a beach. It’s a lyrically clever song about someone trying to figure out what a relationship really is and whether it’s ‘a tattoo or numbers on a hand’ or whether they’re ‘written in the stars babe or written in the sand’. Old Dominion have this great skill for switching between excitable country pop and smooth R&B country in a heartbeat. It’s a welcome break from the later and adds some ‘meat’ to the record. ‘So You Go’ is a song that I’ve been watching a live video on YouTube of for about a year now and was thrilled to see it on the album. It kicks off with a slow building piano and vocal then rips into a huge chorus that should have lighters in the air. This is definitely going down as one of my favourite all time Old Dominion songs and is one that I can’t wait to hear when they support Thomas Rhett in the UK this year. The slow and almost spoken verses fit perfectly with the huge chorus in making you feel that mind spinning desperation of a relationship that has ended when you didn’t want it to. Matt almost screams ‘she tells you it’s over, you don’t believe it, she doesn’t love you, this time she means it’ at the climax of the song before a big instrumental and guitar solo. Great tune! Little Big Town lends a hand with harmonies on ‘Stars in the City’ and things just keep up on that high that the band has us at. The intro rolls into the first verse where Matt sings as if he is talking to you through the speaker ‘we took a u-turn down old 42nd street, almost hit another car, spilt my coffee on my jeans, I said “oh they’re ruined now” she said “no they’re better now, it’s just a matter of perspective, she kissed my cheek, it’s the little imperfections that make ‘em unique, I don’t know how she does it but she could see the stars in the city’. This type of storytelling is why I love country music and why these guys are so good at what they do. This song is all out catchy, feel-good, relatable music with lyrics that just ooze poetry. And let’s face it… Little Big Town singing harmonies ain’t going to do any harm! Now I know that there is a huge Brad Tursi fan base out there who are just going to lose their minds over their man taking lead vox on ‘New York at Night’! This song feels a bit like it could be an 80’s throwback musically which works great. The amazing thing about Old Dominion is that you could ask any of them to do lead vocals or write a song and it wouldn’t be a problem. Mixing the record up with Brad throwing in a vocal is a great idea as his husky voice adds a great compliment to the always-smooth Matt Ramsey! ‘A Girl Is A Gun’ comes up next and we finally have a song that hasn’t really worked for me yet! It’s a good fun song about how dangerous a woman can be and the band have fun with the lyrics in lines like ‘guns shoot bullets and bullets break hearts’. It’s probably one that loads of people will love but it’s just not struck me yet… check back soon though and I’ll probably have changed my mind. The final studio track on the album was co-written with producer and friend of the band the wonderful Shane McAnally. ‘Still Writing Songs About You’ tops of the album with some more ‘meat’ in the way that ‘We Got It Right’ finished off ‘Meat and Candy’. It’s another song about trying to get over someone but still finding yourself going back and writing songs about them. If has a lovely dreamy poetic feel to it and ones of the last lines ‘if you ever wake up and wonder what I’m up to, baby I’m right here, still writing songs about you’ sums this up. As a band who are known for having such a great live show it only seems right that they’d include a live song on the record. This song is a particularly nice inclusion on the album as it was co-written with Andrew Dorff who tragically died last year. It kicks off with a big distorted guitar riff and is all out rock ’n’ roll in the same vain as ‘Shut Me Up’. It’s a great slice of just what the band can do at a live show and a brilliant way to end the album. I think it’s fair to say that Old Dominion are always going to be one of those bands that splits opinion in country music – some will dislike their pop tinged catchy tunes and others will love their sing-a-long feel good nature. We just love the band! With their debut ‘Meat and Candy’ they proved that they can balance the serious stuff with fun songs (hence the title) and they’ve done it again here. Songs like ‘So You Go’ and ‘Written in the Sand’ provide that more weighty subject matter whereas there’s nothing but fun and positivity coming out of ‘No Such Thing As A Broken Heart’ or ‘Hotel Key’. Having a friend and great songwriter like Shane McAnally on production duties again could only be a good thing and that has proved the case. Once again Old Dominion have done exactly what only Old Dominion can do and the end result is full of brilliantly modern country music with catchy hooks and superb songwriting!